The European School Luxembourg 1 was the first of the European Schools. 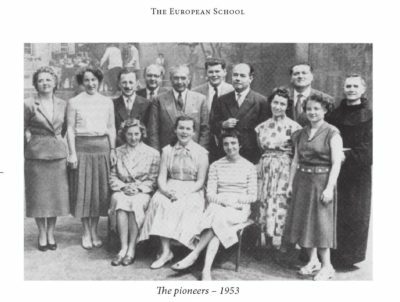 Parents working for the European Coal and Steel Community (see photo) wanted to create a new school that allowed European children from varying language backgrounds to be educated together. On 25 September 1953 they established the Association des Parents des Élèves de l’École Européenne (APEEE). In October 1953, with the support of the Community’s institutions and the government of Luxembourg, the school opened its doors. It was first located in Limpertsberg, then Hollerich and eventually Boulevard de la Foire before moving in the 1990s to its current site on Kirchberg. The first students graduated in 1959; the graduating class was 23. Since then, many generations have attended the school and, in 2012, due to the growing number of pupils, a second school was opened in Luxembourg (Lux 2, in Mamer).